There are taxi drivers, ride-sharing drivers – and then there are chauffeurs. So what’s the difference? Drivers are often casually dressed and remain in the vehicle while the paying passenger opens his or her door and manages their own luggage. Chauffeurs on the other hand are smartly dressed and well-groomed, open and close doors for their clients, carry their bags and are far more attentive and professional without being intrusive. They drive luxury vehicles that are immaculately presented and maintained. The term ‘chauffeur’ sounds French and it is. It comes from the French word for ‘stoker’, when the early steam-powered vehicles required the driver to stoke the firebox with coal. A female chauffeur is known as a ‘chauffeuse’ but the term has largely faded from use. During the first half of the 20th century a chauffeur would most likely be employed by a wealthy family to drive and maintain the owner’s car. We’ve all seen the cliché images portrayed in old movies — an older gentleman with a white moustache polishing the Rolls Royce in a sweeping driveway and waiting patiently for his employer to emerge from the mansion. Some wealthy individuals and celebrities still employ their own chauffeur. But these days a chauffeur is more likely to be an owner-driver with just one or two cars, or to be employed full- or part-time by a large company with a fleet of vehicles. So what does it take to be a successful chauffeur? Well, they must enjoy driving – after all, they will spend most of their day behind the wheel. They must also know how to interact with individual clients and be prepared to respond to any request. A great chauffeur will be able to read their clients’ body language and mood and anticipate when to speak or stay silent. A chauffeur who is constantly on the speaker-phone, or who asks prying questions of the client, won’t last long in the business. VIP clients pay for and expect a premium service and for their privacy to be respected. Some clients may be regulars and the chauffeur will have already established a rapport with them. The chauffeur will know their habits and preferences and respond accordingly. A great chauffeur must deliver a standard of service that will turn a first time client into repeat business. A chauffeur’s working day may start at 3 am if there is a client departing or arriving on an early flight at Sydney Airport. Arrivals can be tricky. The chauffeur will either track the flight he’s meeting on a phone app to ensure it’s not delayed, or have it monitored by someone at his base. A very late arrival can throw the rest of his or her day’s schedule into chaos. There should be time for a quick breakfast before more airport transfers and point-to-point bookings. Early afternoons can be less busy and the chauffeur can usually take an extended break and check that the vehicle is still spotless. Evening shifts are usually busy, especially Friday and Saturday nights or when there are major sporting events and concerts in town. An experienced chauffeur will know how to avoid the worst of the traffic and use bus lanes to get clients to their destination on time. Often functions do not end until well after midnight and a chauffeur on the night shift may not finish until after 3 am. Not all jobs are as routine as airport and point-to-point transfers. Being a chauffeur for a wedding party requires additional skills. It’s often the case that the chauffeur will provide and serve champagne and finger food during the couple’s photo session. He or she may also need to roll out the red carpet at the wedding venue and reception, attend to any requests by the wedding party, and to have available a sewing kit, hair spray and other items in case of last minute mishaps. Sightseeing trips with clients can present other challenges for a chauffeur. Not only will the chauffeur’s driving and navigation skills be on display but they must have a thorough knowledge of the history and significance of the places they visit. Tours may sometimes run for as long as eight hours so a chauffeur must have the right personality to keep the clients happy and engaged. Not all chauffeurs have the aptitude or temperament to be a successful tour guide as well. Safety, comfort and punctuality are the hallmarks of what a good chauffeur offers their clients. But there’s a twist in the tail to being a chauffeur; they will spend a large part of their day in the company of the rich and famous but will most likely never be wealthy themselves. So, you’re planning for the big day and wedding cars are on your ‘to do’ list. Let’s see if we can help you with some of the ‘do’s and don’ts’ and make some suggestions that will eliminate part of the stress. Both the size of your wedding party and the style of car will determine the number of cars you will need. Most often it’s one sedan-style car for the bride and her father and another for the bridesmaids. Of course, you may decide that one car is adequate if it’s only the bride and two or three bridesmaids. On the other hand, you may wish to provide cars for the groom and his party as well as the parents of both the bride and groom. If you have guests who have flown in from interstate or overseas, do they need transport? You may also choose to have a car available when you leave the reception. The options are many but you need to keep in mind your budget. It’s best to book your wedding cars at least six months in advance so you have the widest choice and avoid disappointment. Sometimes it’s left to the groom to arrange the wedding cars but the bride should also be involved in selecting the right cars for the occasion. While a muscle-car with loud exhausts might be the groom’s preference, it may not evoke the right mood for your wedding. There are hundreds of cars to select from so it’s a good idea to first have in mind the style of cars that you think will best fit with your wedding. Sports cars, classic and vintage cars, stretched limos, even Kombi Vans as well as conventional modern sedans are amongst the choices. A great place to start your search is on the Easy Weddings website <http://www.easyweddings.com.au/WeddingCars/Sydney/>. You’ll find Revel Drive’s luxury zero-emission cars listed there together with dozens of others, all offering different styles and models of cars. There are a couple of important points to consider when selecting the right style of car for your wedding. Open-top sports cars might be flashy but your wedding is probably months away and you can’t predict the weather on the day. They can also be cramped, more difficult to enter and exit gracefully and can play havoc with a bride’s hairstyle. Also remember that some vintage and sports cars won’t have air conditioning, which is essential if you’re to arrive feeling fresh and comfortable on a hot day. While vintage cars are usually impeccably maintained, breakdowns are not unheard of. Ask the vintage car hire company if they have had any problems with their cars in the past and what car they will supply if the one you’ve chosen is not available on the day. Now create a shortlist of the providers that offer the style of car that suits you and begin to narrow your search from there. A good place to start is with those companies that are within a reasonable distance of your wedding, but don’t overlook others further afield if they provide exactly what you want. We’re based on Sydney’s Northern Beaches but cover the Greater Sydney metropolitan area as well as the Central Coast, Blue Mountains and Illawarra. Once you believe you have selected the right car and hire company, ask to inspect one of their cars to ensure you’ve made the right choice before you make the booking and most companies will be happy to arrange a time and place for you to view their cars. Although often overlooked, this is also the ideal time to check that the car hire company has all the necessary licences and insurance, and that their drivers are experienced and fully accredited chauffeurs. Let’s consider your budget. It could cost as little as being driven to the ceremony in a friend’s car at minimal expense, or as lavish as having four, five or more chauffeur-driven cars costing many thousand of dollars. The length of time you require the cars will also be a major factor in the total cost although most providers will offer discounted hourly rates for bookings longer than two hours. Many car-hire companies will have a two-hour minimum and you can expect to pay between $150 and $300 an hour for each car (depending on the type of car and inclusions) for the first two hours then less per hour for longer bookings. Your car hire company will require a deposit at the time you make the booking — anything between 10% and 50% of the quoted price. Also ask about their policy regarding cancellation due to unforeseen circumstances as some providers stipulate that the full fee will be forfeited if the booking is cancelled within a certain number of days before the wedding. Read all the fine-print to avoid any unexpected surprises. You need to be aware that if your wedding is running beyond the time that you have the cars booked, there may be additional charges. Most providers will have some built-in flexibility but others may immediately start to charge extra in fifteen-minute increments. Ask your provider about their policy regarding running over time when you make your booking. The vast majority wedding car companies will provide a high-quality service at a fair and reasonable price. But compare prices and make sure you’re not being charged a hefty premium just because it’s a wedding. We have seen hire car companies charge fifty percent more for the same car as another provided offering the same vehicle. Revel Drive is committed to proving you a superior service with the most advanced vehicles and at a cost to fit your budget. Canapés, sandwiches and chocolates to have during the photo shoot. Lastly, a representative of the car hire company should contact you a week or ten days ahead of your wedding to check that there are no last-minute changes. They should also have checked with you about the availability of parking at your departure point and at the wedding venue. The cars should arrive at least ten minutes ahead of time, washed, polished and with spotless interiors. It’s likely that both the cars and drivers will be in some of your wedding photos so it’s essential that chauffeurs are smartly dressed and well groomed. Revel Drive can provide a wedding package tailored to suite your requirements, see details here Australia Wedding Tesla Limo Service. Call us on 0404 33 77 99, email us at <[email protected]om.au>, or use the contact form on our web page <https://reveldrive.com.au/contact/> to make an enquiry. Tesla Inc. (usually shortened simply to Tesla) was founder in 2003 by a group of engineers in Silicon Valley, California and they were joined the following year by the present CEO, Elon Musk. The company name was inspired by the inventor, Nikola Tesla, who patented the Alternating Current (AC) induction motor in 1888. In 2008, Tesla launched the Tesla Roadster, a two-seater sports car that set a new standard in electric vehicles. While only 2400 were built, the Roadster was notable for being the first street-legal electric car to use lithium-ion battery cells and the first electric car to have a range of more than 300km. Production of the Roadster ceased in 2012. 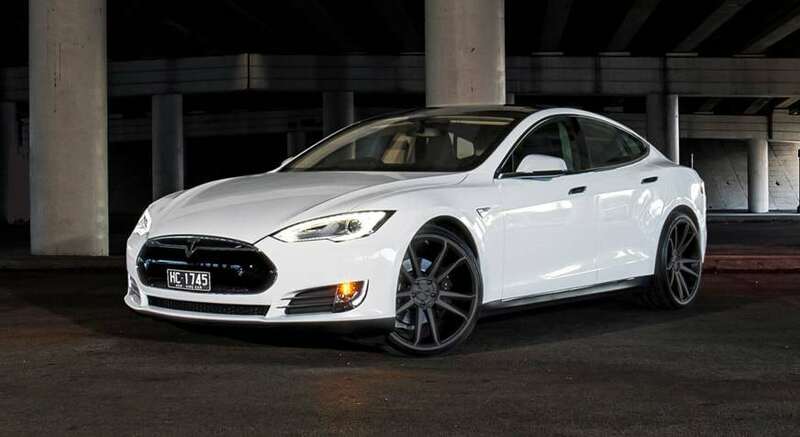 The next model launched by Tesla was its first sedan, the Model S, which became available in 2012. With room for five passengers (with the option of an additional third-row rear-facing seat for two children) and more than 1.8 cubic metres of storage, the Model S combined the comfort and utility of a family sedan with the acceleration of a sports car. In late 2014, Tesla CEO Elon Musk unveiled two dual-motor all-wheel drive configurations of the Model S that further improved the vehicle’s handling and performance. The 85D featured a high-efficiency motor at the front and the rear, giving the car unparalleled traction control in all conditions. The current top-of-the-range Model S P100D has a range of 500km at highway speeds and accelerates from 0 to 100km/h in 2.7seconds. A sport utility vehicle (SUV), the Model X, was added to the range in 2016. Tesla claims the Model X is the safest, fastest and most capable SUV ever built. Its most eye-catching feature is its two, rear ‘Falcon Wing’ doors that open out and up to provide unrestricted access to the second and third row seats.